editor's note: Tonight at 7PM, the group ‘Brazilian Support NYC’ will hold a rally in Union Square in coordination with a General Strike called in Brazil by several major Unions that same day. Outraged at the brutality shown by the Military Police in various cities in Brazil during the most recent massive protests since early June, the group will focus their message against repression and will connect to local struggles, having the rally in solidarity with Ramarley’s Call, a group that works to bring justice to the Graham and other families who have lost their loved ones at the hands of a brutal and racist New York Police Department. At 7:30 pm there will be a joint speak-out together with the families of victims of the NYPD, to connect between global and local struggles against police brutality: from NYC to Brazil: No More Police Brutality! Although not isolated from the uprisings that have been taking place around the world, the protests that have been taking place in Brazil are not merely a reflection of the global mood. In addition to the battles in the streets, there is a contest of stories taking place. Various forces across a diverse political landscape are locked in their attempts to manipulate and transform the narrative of this historic upheaval in their own image. As is now very known, the spark that led to the protests was the increase of 20 cents in Brazilian reals on public transportation fares in São Paulo and other cities. The group that led the demonstrations from the beginning was the Free Fare Movement, known as MPL. 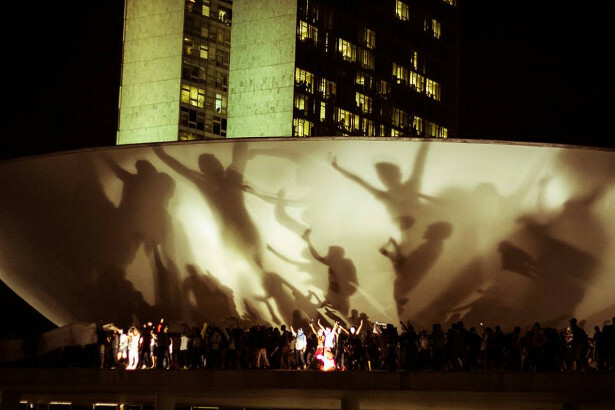 It was formed after the World Social Forum in 2005, in the city of Porto Alegre. MPL defines itself as an horizontal, autonomous, nonviolent and non-partisan organization with a clear agenda: free and decent public transportation. In response to the most recent hike, starting on June 6, thousands responded to MPL’s calls and barricaded highways and avenues. The marches were met with extreme brutality. A paramilitary police force used tear gas, rubber bullets and other so-called “non-lethal weapons” against peaceful protesters. There were hundreds of arrests. Over the course of one week, several more marches were organized, and their size grew. The repression from police escalated, and so did the protesters’ response. Buses, train stations and banks were looted. The numbers on the streets only increased, and the scope of political dissent expanded from just transportation to a much wider range of issues. Meanwhile, the mass media played a role in trying to diminish the significance of the protests. “There is maybe the influence from the struggle in Turkey, where the fight is just and important,” political commentator Arnaldo Jabor said on national TV. “But this revolted middle class here isn’t worth even 20 cents.” Protesters were called “vandals” and “barbarians.” The São Paulo newspaper Folha published an editorial on June 13 claiming that “the few protesters that have something in their heads besides their hoodies justify the looting as a response to the supposed police violence.” But that night, Giuliana Vallone, a young reporter from the same newspaper, was shot in the eye with a rubber bullet by a military police officer. A photo of her injured face spread around the world. 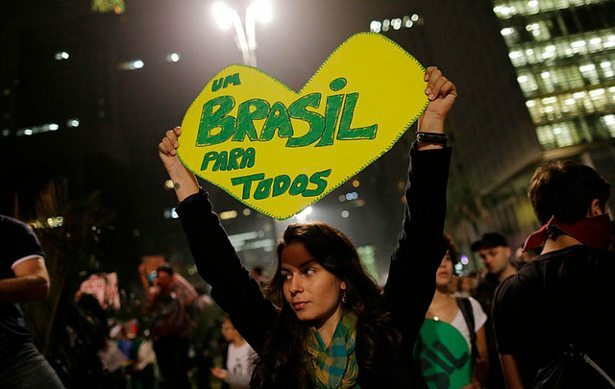 As the protesters gained support from a large part of the population, a change came over the discourse of the Brazilian media. Jabor apologized publicly, saying that he actually wanted to see the youth in the streets. One day, the news was deeming the protesters vandals, and the next they became heroes. Pundits began calling on the youth to go to the streets wearing white, to ask for peace, and to fight for a “better country” and against “corruption.” Many activists blame this media endorsement for the increasingly nationalistic tone that subsequently came over the protests. On June 17 there was a nationwide demonstration. Each city had its own way of participating. Demands relating to a variety of issues were on display, from transportation to education to the expense of preparing for the World Cup. But the overall tone was a very nationalist one. People were singing Brazil’s national anthem in the streets, and the country’s flag was everywhere. It began to appear as if the demonstrations had been steered by the establishment media and its language of “corruption” as a nationalist uprising against the current president, Dilma Roussef, and her left-wing Worker’s Party. The next day was especially confusing for the leftists who had worked to organize the movement in the first place. “Everything is so weird,” wrote Moschovich. Sure enough, by the end of the day, the fare hikes in São Paulo and Rio de Janeiro had been cancelled. The next day, MPL went to the streets of São Paulo to celebrate its victory, but protests continued across the majority of the country. Narratives became confusing as initially non-partisan messages were replaced with opposition to one party or another. Left-wing partisans were attacked by members of the extreme right and neo-Nazi groups. While the mainstream media kept pushing the conversation against corruption, blaming the Worker’s Party for all the country’s problems, some began to fear for a mobilization of the extreme right and even the possibility of a military coup. Countering that narrative, in turn, Brazil’s government took steps to address more of the protesters’ demands that it wanted to highlight. President Dilma proposed that all oil revenue should go to education and health care; this proposal has already undergone many changes, however, and it is still being debated by the legislature. “The giant woke up” has been the slogan used by media. And, like the 2011 uprisings in Tunisia and Egypt, there was enough unity about demands to compel prompt action from those in power. But the question remains of how the breadth of discontent in Brazil will be channelled by those in the streets and those with access to the media.